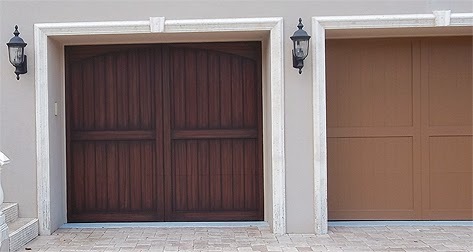 These three single door carriage style garage doors were painted to look like aged wood. Before painting them they were the same color as the home. 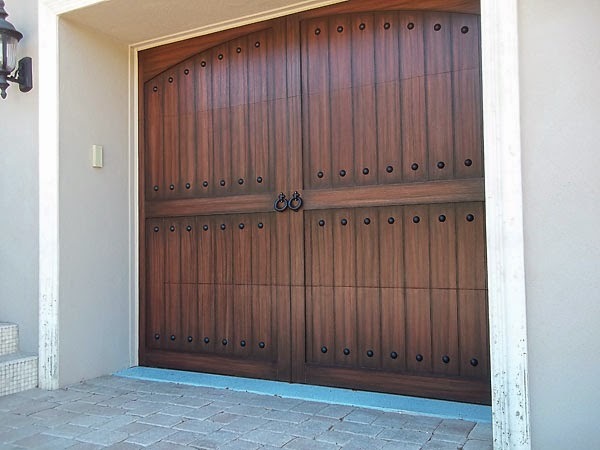 After I painted the garage doors 56 'clavos' were added to each door as well as the 'door openers'. The next photograph shows the same door before the clavos were added. Adding the clavos made a huge difference in the overall look. 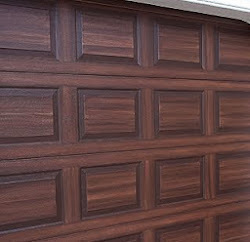 In this next picture you can see where I have finished painting the first of the three garage doors to look like wood. The garage door to the right of it has been primed and then I applied a base coat of SW Toasty to the door which enables me to give the doors a nice warm wood tone. 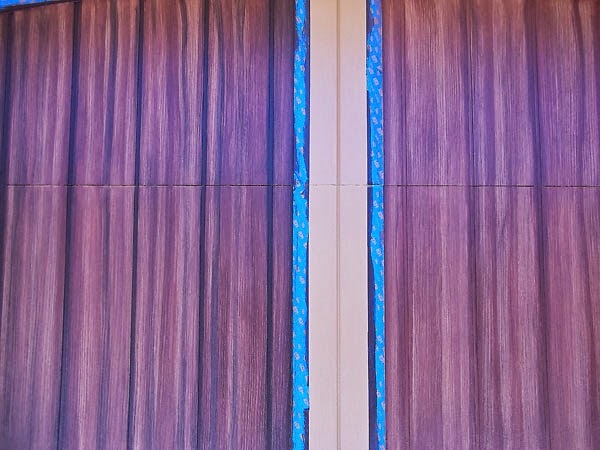 As always when I go to paint a garage door to look like wood I use a lot of tape to tape off each area I will be painting on. I do this to avoid over painting the wood grain onto an area or section that will have its own wood grain pattern. 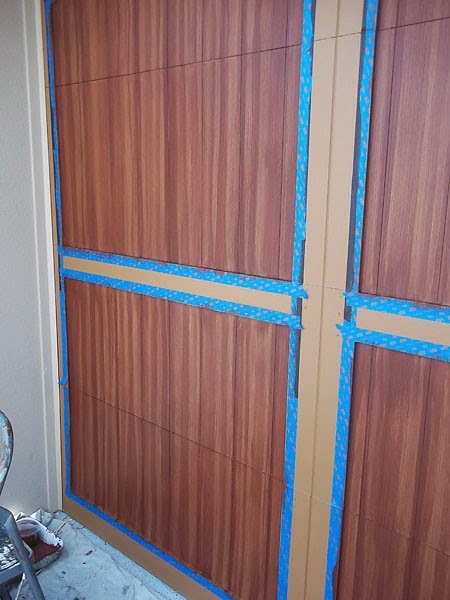 So you can see in the photo that I have taped off the center of areas of the doors to work on those first. 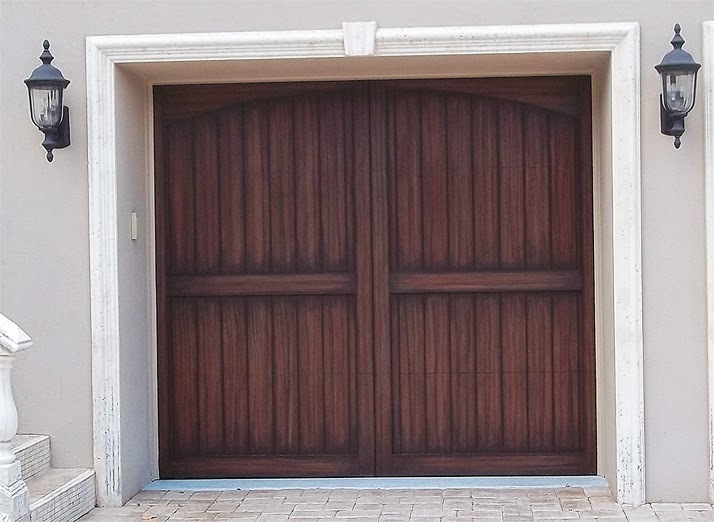 Like I said the base coat color of paint on these garage doors is SW (Sherwin Williams) Toasty, then the first color of the wood grain colors I am using is SW Fiery Brown. 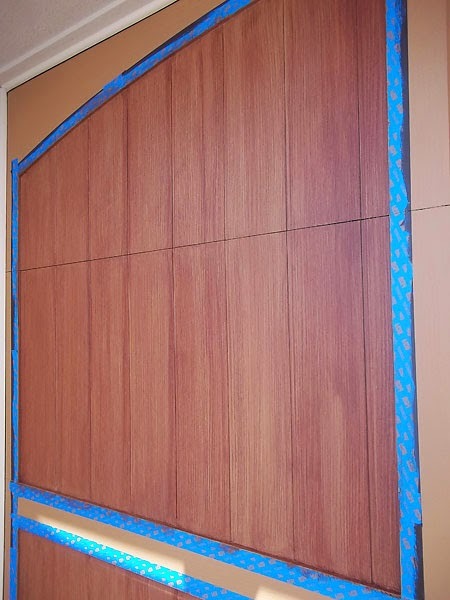 So the first step in painting a wood grain on the garage doors is to apply a very thin layer of the Fiery Brown on the door. I thin down the paint with water and make the vertical paint strokes on the planks of each section of the garage door I have taped off. After this first step the planks will have a wood grain look but not as defined as I want it. I always work in steps from lighter to darker. The reason is after the paint dries you can always make it darker but in order to make it lighter you have to start over by painting the base coat color again and starting the wood grain steps over. So going lighter at first is the way to go. After the first pass with the fiery brown has dried, which on this day takes about 15 minutes, I then make a second pass but not all over. What I did was paint in some darker vertical grain lines on each plank. In order to do this I still thinned down the paint but only a little. 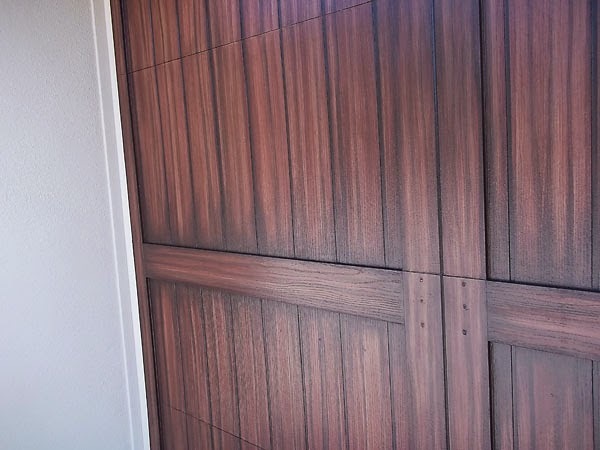 The next photograph shows the door after I have painted the darker grain lines with the fiery brown in the second step. By the time I am done painting this second step with the fiery brown the first section is dry. So then I can start with the second color for the wood grain pattern and for that I am using SW Black Bean. It is a very dark brown. Again I apply the first pass of the black bean in a very light transparent coat, and I mean very light. This color will darken up the door very fast if you put it on too heavy so I have to be careful. In the next photo you can see the section on top has the first coat of the black bean. It makes the door noticably darker but not substantially more. The next photograph shows the second pass of the black bean on the left and the section on the right has only the first pass of the black bean. With the second pass I again want to make some defined grain lines so that is what I am painting - just the darker grain lines and not all over the planks. I am still thinning down the paint but like with the fiery brown I do not thin it as much on this second pass. Between eack plank on these doors there is a channel of about a 1/4 inch to 3/8 inch wide. I take the black bean and paint in that channel a solid black bean color, so that is the very straight dark vertical lines you see. One thing I have to say here is color of the photos vary from shot to shot. That is mostly because of the light of the day shifts during the day and I am using a very inexpensive camera to get these photos. I find it very hard to get a decent photo of color working outside because of the glare and other environmental factors but it is what it is. So the photo below is the same door shot at a different time of day and at a different angle. It is actually more like the true color of the door. The photo above is way more reddish tha the doors actually are. 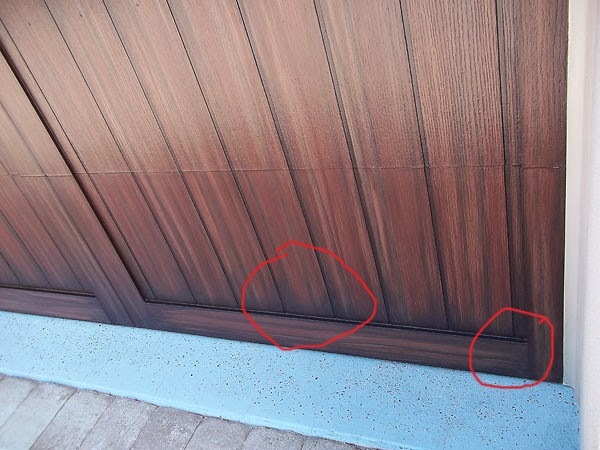 I have made some red circles on the photo below to show you the last step in the process of painting these doors to look like aged wood. 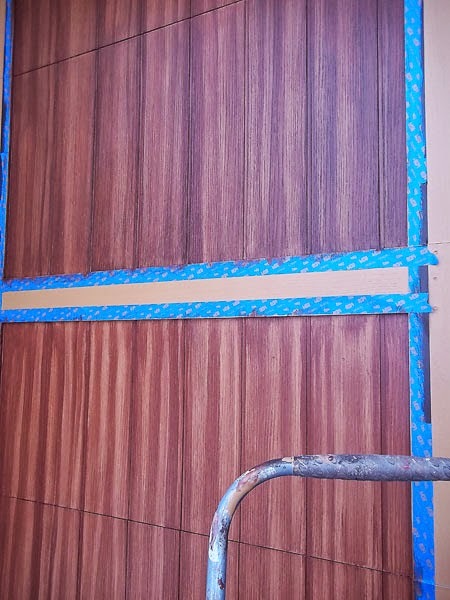 What I have done is at the ends of each plank on the door (whether it is a vertical plank or horizontal plank) is paint the black bean heavy at the very end then feathered it out about 2-4 inches to give each plank an aged look. This technique works really well. The next two photos give you another angle of what I am talking about, you can clearly see how at the ends of planks it is darker. 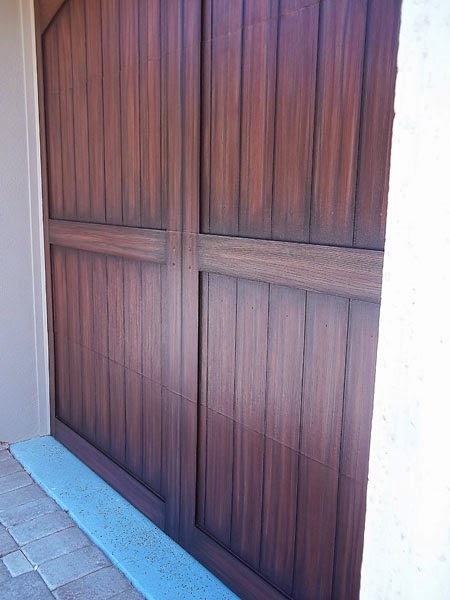 As always the last step I take in painting a garage door to look like wood is to apply an acrylic clear coat for protection and preformace of the paint job. I use a product called MasterClear Supreme for this. 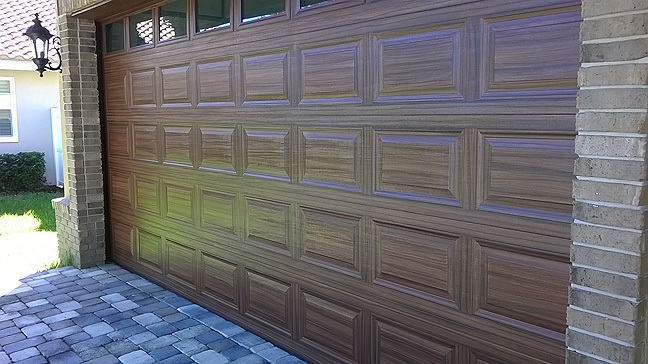 Let's take another look at the finished garage door with the clavos on. 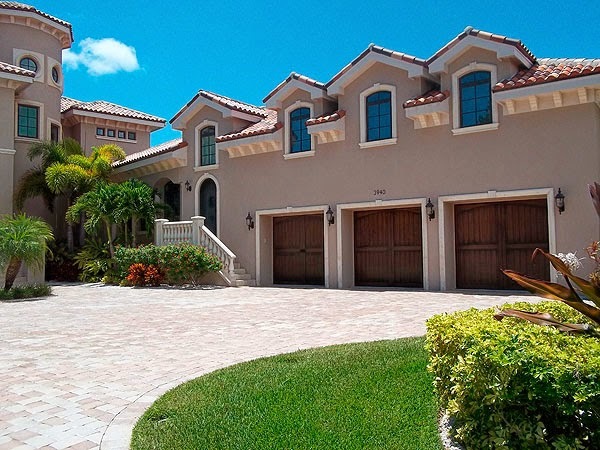 What a great look this is for a home with the Mediterranean style architecture.